Sun Noodle makes one of my favorite instant noodles, Hawaii's Original Saimin. A big reason for it is because of the fresh noodles. The broth is good, but I'm not crazy about it. One of my favorite flavors of traditional Japanese ramen is tonkotsu ramen, so when I saw that Sun Noodle made their own, I had to try it. Will I love it just as much as their saimin? Continue reading to find out. For those of you who don't know, tonkotsu ramen has a thick broth made from boiling pork bones, fat, and collagen. It results in a slightly cloudy white colored broth. I usually get this or shoyu ramen whenever I visit ramen restaurants. 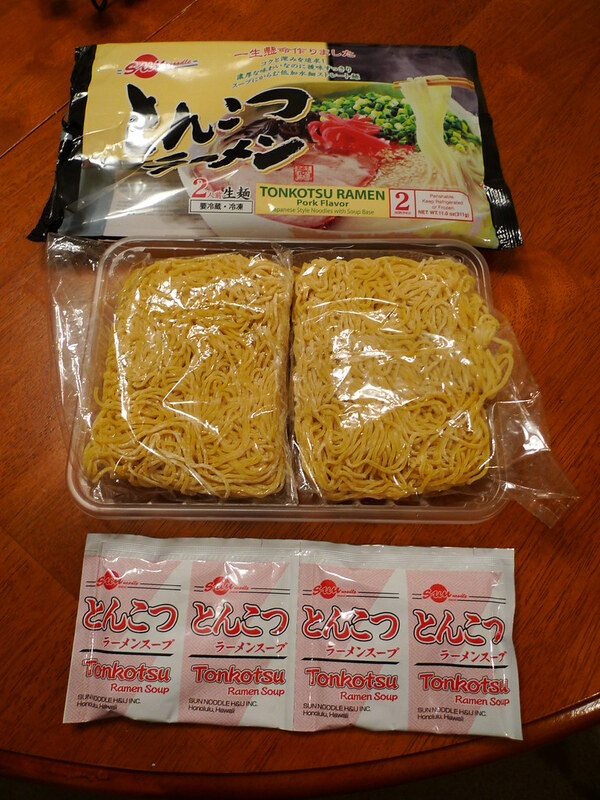 Contents of Sun Noodle's Tonkotsu Ramen. 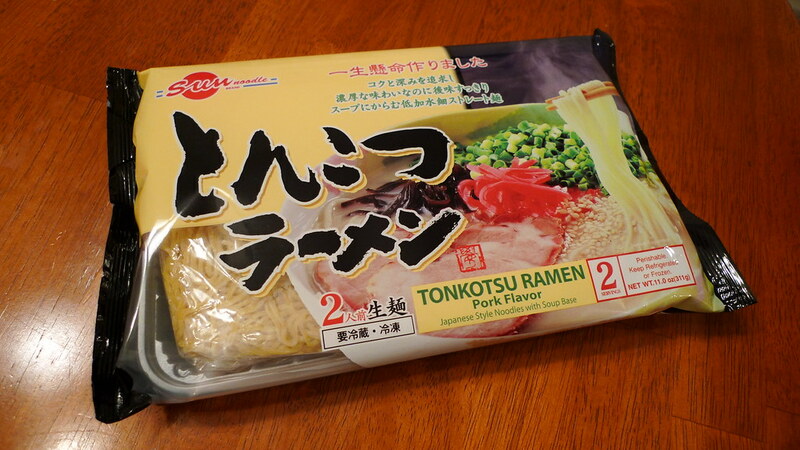 Sun Noodle's tonkotsu comes in a big package with two full servings separated in one bag. I only cooked one serving for this review. 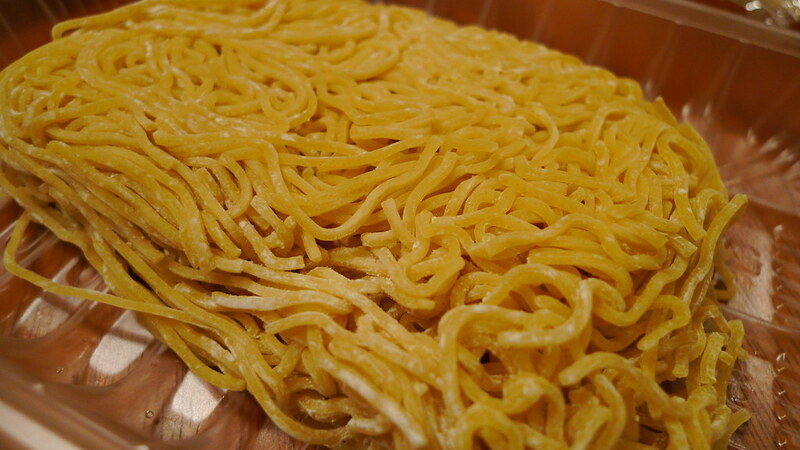 The noodles are thin and mostly straight like real tonkotsu ramen should be. They are fresh noodles from the refrigerated section and still have flour on them to make sure they don't stick together. 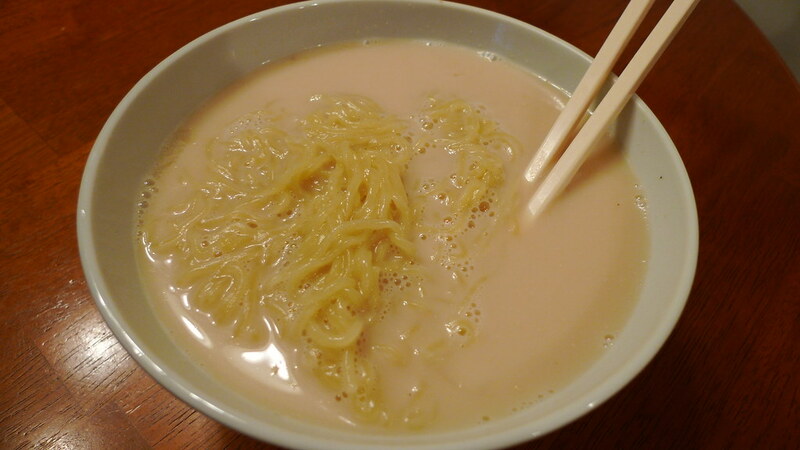 The noodles are cooked separately from the broth. Tonkotsu ramen noodles waiting to be dropped in the boiling water. The seasoning packet actually has a really thick paste in it. It's really unattractive looking. You're supposed to plop it into a bowl with 1.5 cups of hot water and mix it. The picture below will show you what that looks like before stirring. Hideous, huh? It doesn't get much better either. Now, I know tonkotsu is supposed to be a murky white broth, but the final outcome for Sun Noodle's tonkotsu is just ridiculous. It looks as white as milk. 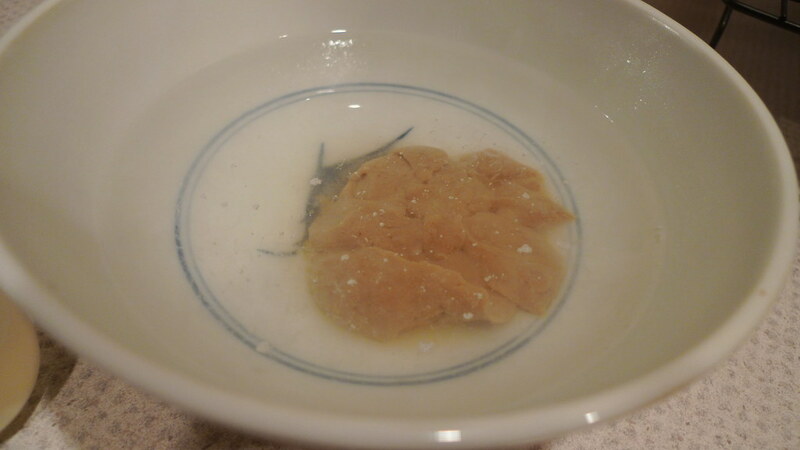 Tonkotsu flavoring turd at bottom of hot water in bowl. The broth tastes fine. Actually, it tastes really good. Best instant noodle tonkotsu I've had. But I have a really hard time getting by the Snow White broth. I've never seen it look this cloudy before. I couldn't tell my brain to keep ignoring the fact that I'm drinking pork extract and not milk. It's weird. Other than that, this is a fine bowl of noodles that would benefit from some actual pork meat, or even chicken meat, an egg, and maybe some scallions. Crazy milky looking broth in this one. Compare it to the tonkotsu ramen I get at Samurai Noodle. Big difference, huh? Juliana liked the noodles and she drank the broth. 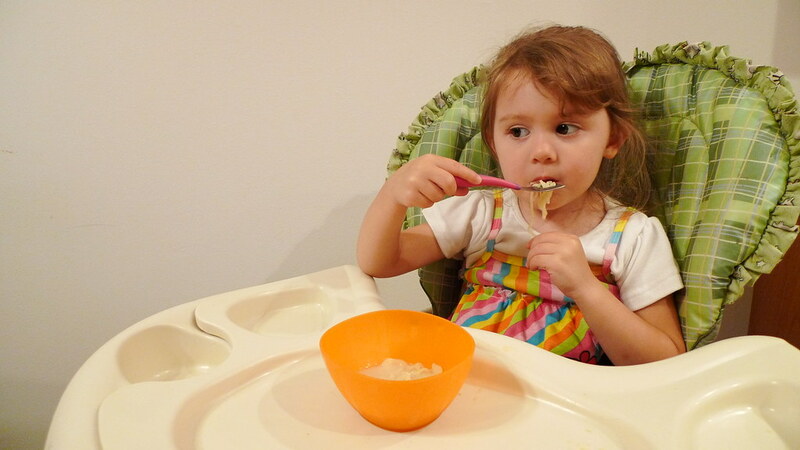 I think as a child, she doesn't really think about how the soup looks, so she can focus on the taste. So, there you have it. This is something I could eat every once in a while, but not too often. 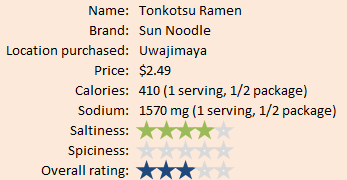 There's gotta be better instant tonkotsu ramen out there. Any suggestions?